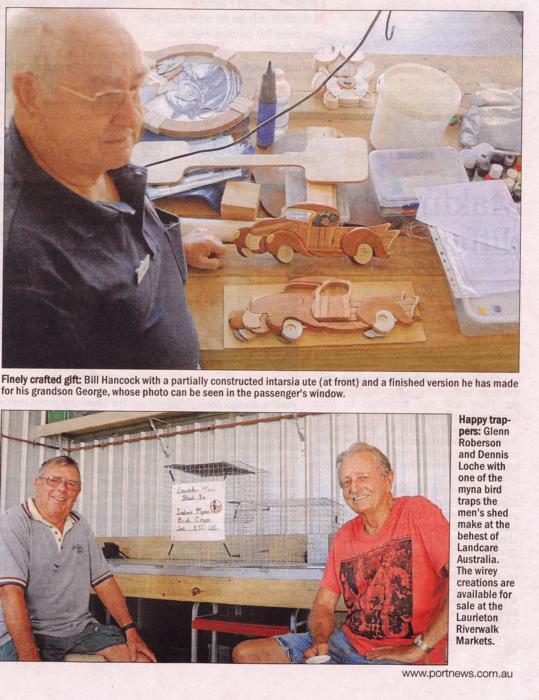 Member-run Laurieton Men's Shed kicking some goals. 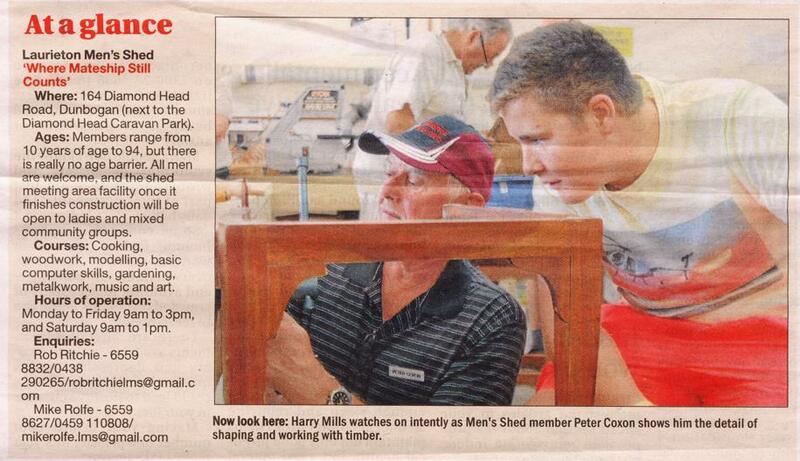 In the shed: Laurieton Men's Shed president Barry Hume says the members really run the decision-making at the shed. The Laurieton Men's Shed is striking the perfect balance between community projects, learning new skills and men's health. Boasting 170 members and operating Monday to Friday, members are involved in working on their own projects, community projects and working with local schools. President Barry Hume said the driving force behind the shed's birth was Robert Rule, who organised the land for the sheds and their construction and also contributed toward the early days. "He did a tremendous amount of work in the early stages with meetings," he said. "That really set us up for a solid start. "The shed really is run by the members and of our total membership we have about 40 members who would get here multiple times each week. "Since January 1, 2013, we've had 25,000 signatures on our entry book - it's a pretty big effort. We put all major decisions into the hands of the members. There are no bosses here. "Unfortunately we are not funded by any one organisation but rely on membership fees - $30 per year - and whatever grant is being offered at a particular time of the year." Vice president Richard Curry said the current year has been one of the best in the club's history. "We are trying to get everyone involved in different aspects of what we do here," he said. "We put all major decisions into the hands of the members, so they will decide if we buy a certain piece of equipment or that we purchase dust collectors for the wood work area, for example. "There are no bosses here. "Everything is about prioritising what we do. Intricate work: Shedder Allan Wallace putting the finishing touches to another Intarsia wood work piece. "For capital expenditure items we cannot do much without applying for grants." Mr Hume said the next major decision facing the club will be the purchase of the land for the men's shed. "There will be legal costs and perhaps stamp duty," he added. While the traditional aspects of shedding is available at Laurieton, they also have a few specialities. This includes extensive gardens, a couple of keen cooks, a choir that performs for the public is about to bring up its 100th show along with bee keeping, jigsaw puzzles and even enjoying a cup of coffee. Mr Curry said all members are keen to share their skills and knowledge and this is another strong point for the shed. "Last week I was listening to a group of blokes sitting a table and they starting talking men's health," he said. "They were talking about prostate issues and health problems. "I thought I was crook until I listened to them." The shed also hosts monthly guest speakers to address men's health issues. The Laurieton Men's shed is open five days and is on Diamond Head Road. For operating hours and information contact 0417 277 231. The Laurieton Men’s Shed (LMS) choir has notched up 100 community performances. The choir reached the milestone at the Bishop Tyrrell Aged Care Facility on Monday, December 3. Mike Rolf formed the choir with maestro Laurie Orchard and convinced a group of men to sing at the Laurieton Schools of Arts for a community fundraiser. Mike Rolf has since passed away, but his legacy lives on through the voices of the men who turn up to sing each week. Before Mike passed away he handed over the choir’s leadership to Neil Radford. Graham King took over from Neil when he moved away from the area. Maestro Laurie Orchard is the only member of the choir who has been to every one of the 100 performances. Member of the choir Robert Scott said Laurie threatened to retire when he reached 90-years-old but is still going strong at 91. “His guidance has made it possible for the men to entertain at most of the aged care facilities and community groups in the Camden Haven area,” he said. Some people can be at a loss as to what to do when they retire. That’s not the case for members of the Laurieton Men’s Shed, if anything they’re busier than when they had full time jobs. Treasurer John Denyer has been a member for seven years and was recently nominated for a NSW Volunteer Award by his peers, for his work with the organisation. Before he retired, John worked at the Australian Mint in Canberra as production manager. He jokes he used to ‘make’ $80,000 a day. He finds his work as treasurer satisfying and he takes pleasure out of giving back to the community. A lot of the members of the Men’s Shed have come from jobs in trades and manufacture. “We worked with men mostly and I think that’s why coming to the Men’s Shed is so important for a lot of blokes,” vice president Richard Curry said. Richard said it’s important for men and women to have their own hobbies when they retire, to give each other space. “Most of their lives are spent working, so when they retire they spend a lot more time together, but it’s important to have separate interest,” he said. Richard and John said a lot of the men talk about physical or mental health issues, they feel they can’t talk about with their wives or partners. John said there is something for everyone at the Men’s Shed. People participate in activities including the choir, metal work and woodwork. There are other people who might prefer to sit and quietly put together a puzzle or listen to music. “It’s their choice as to what they want to do,” John said. In August the members hosted a Father’s Day luncheon at the location. 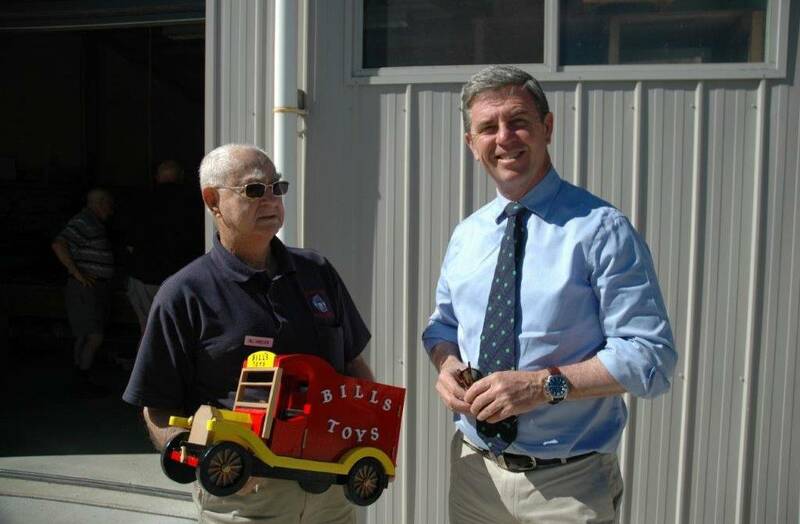 Richard said the Men’s Shed would also like to host high school students, to teach them the basics on car maintenance. The members have highlighted a barrier which prevents older people from visiting the Men’s Shed. “There’s no bus service out this way and it makes it difficult for people who can no longer drive to get here,” Richard said. Laurieton Lakeside residents expressed joy when they got the opportunity to play their new instrument on Monday, October 22. 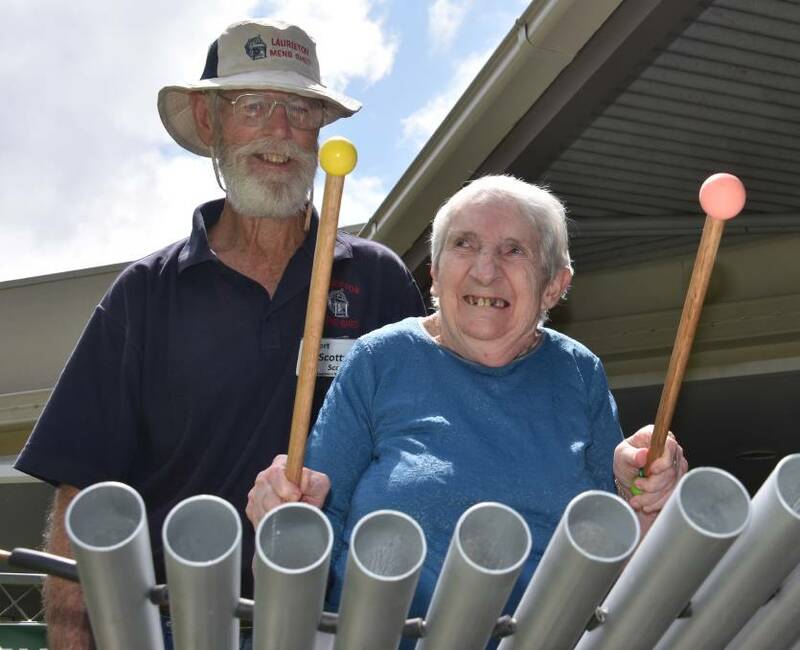 The instrument was implemented in an outdoor space at the aged care home, where residents will have the opportunity to play tunes on a daily basis. Laurieton Lakeside staff member Cassie Greentree said she was so grateful to the Men’s Shed Laurieton for the kind donation. Cassie said the centre did research into how music helps alleviate anxiety related to ageing. “We looked at purchasing some outdoor musical instruments but the cost was enormous,” she said. 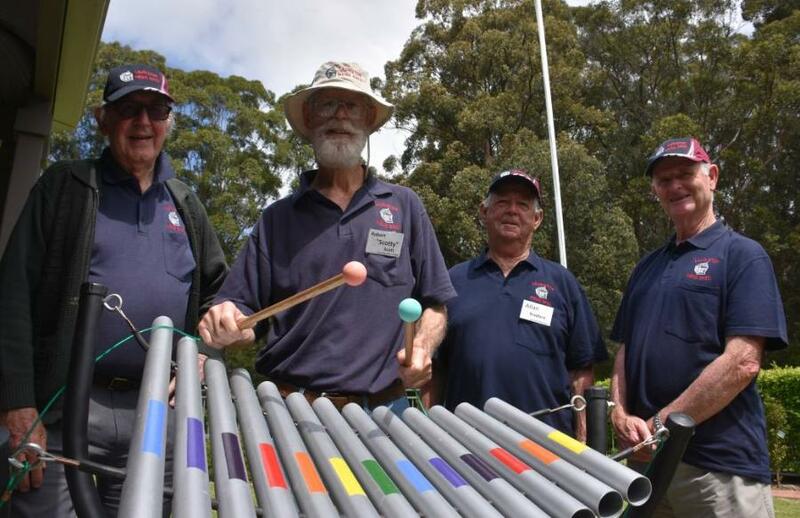 Laurieton Men’s Shed members were instrumental in bringing the xylophone creation together. Robert Scott helped to engineer the design and former music professor Laurie Orchard gave the instrument the fine tuning it needed, to be put into practice. “When Robert sent me a video of the first test, I noticed the second last note was actually a B flat,” Laurie said. Robert had to trim back the piece of pipe to ensure it would ring a clear ‘B’ note. Laurie said the range of the instrument extends to an octave plus six notes. Cassie said the centre was so grateful for the support provided by Men’s Shed members. “They were so accommodating to all the factors we had to take into account. Robert and Laurie collaborated for about six weeks to bring the instrument together. “It was a lot to do with trial and error,” Robert said. 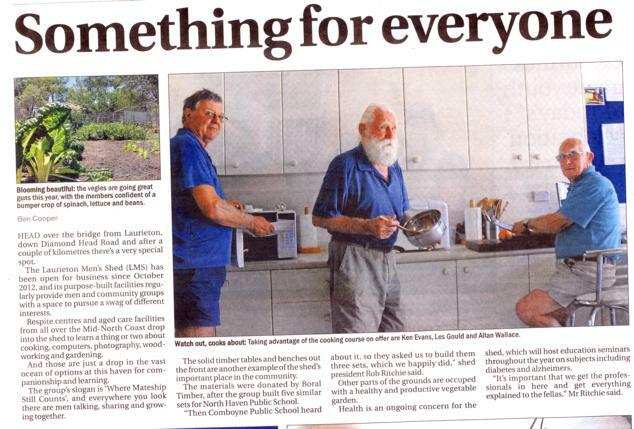 Laurieton Lakeside is installing a plaque at the centre to acknowledge the Men’s Shed members for all their hard work. “It wouldn’t have happened without the passion of these men,” Cassie said. Laurieton and Kendall Men’s Shed have received funding to expand and improve their facilities. Federal Member for Lyne Dr David Gillespie said the funding will support men’s physical and mental health. "The $5,000 grant to Laurieton Men’s Shed and the $3,500 to Kendall Men's Shed will mean a lot to their members and the broader community and I congratulate them on their success,” he said. Kendall Men's Shed will use its funding to provide specialised woodworking tools and equipment identified by members to enable additional activities, delivery of training and education to address health and safety. Laurieton Men's Shed will use the funds to provide specialised woodworking tools and equipment identified by members to expand activities and produce quality products. There will be improvements to the shed facility to address health, safety and storage. “Both Laurieton and Kendall Men’s Sheds help men, particularly as they get older, to connect with each other to prevent social isolation and preventable health conditions,” Dr Gillespie said. “This funding round helps the group to buy tools and equipment, support community projects and training, maintain or develop their buildings, or create local activities to improve men’s health. 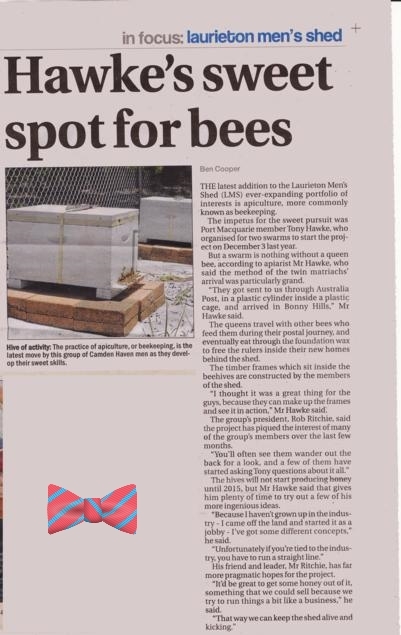 The Laurieton Men's Shed has 150 members and provides a focus on health and wellbeing through activities including woodwork, gardening, health seminars, metalwork, community projects, vehicle restoration, furniture repair and restoration. Members learn skills through computer training, cooking, lifestyle seminars, community and personal projects, regular speakers, friendship and social activities and member outings. The Kendall Men's Shed has 109 members and has a strong focus on teamwork and improving skills. The group members contribute to the community through the maintenance of the Kendall RSL Cenotaph Park and donated picnic tables. The group is involved in projects including the RSL, schools, Driver Reviver and the local GP medical service. “Men’s Sheds provide a sense of community, a safe and friendly environment where men can work on meaningful projects at their own pace, in their own time, in the company of other men,” Dr Gillespie said. This grant funding is part of the $5.1 million the Federal Coalition Government has provided to the Australian Men’s Shed Association through to 2018-19 to support the national network of Men’s Sheds. This month members of the Laurieton Men’s Shed group are celebrating the two year anniversary of the official opening of the shed. The group’s secretary Neil Radford said the shed continues to grow and diversify in keeping with the community and the members’ needs. “We acknowledge the wonderful contributions of a large number of people in the Camden Haven and the greater Hastings region who made the whole project possible through their donations of time and money,” he said. Mr Radford thanked founder Robert Rule ‘whose vision and tenacity put the project on the map’. He also made mention of the generosity of the current land owner Ross Hanslow, and before him Terry McGeary for making the parcel of land available to the group. The project of forming the shed began late in 2011 with the turning of the first sod. Mr Radford said since that time the shed has been successfully managed by a number of different committees to ensure the building’s completion. “The project was a triumph and a major milestone for all involved with the issuing of the final occupation certificate in 2015,” he said. The secure future of the location of the Men’s Shed will further be assured for the long term once the transfer of the land is completed in accordance with the wishes of the initial donor Terry McGeary. The group has been involved in many community events and continues to support local schools, pre-schools, aged care facilities and many community groups. Members have assisted in projects including the construction of picnic tables for Laurieton Public School, an honour board for the Laurieton Fire Station and provided drivers for the Lakeside Village community transport service. 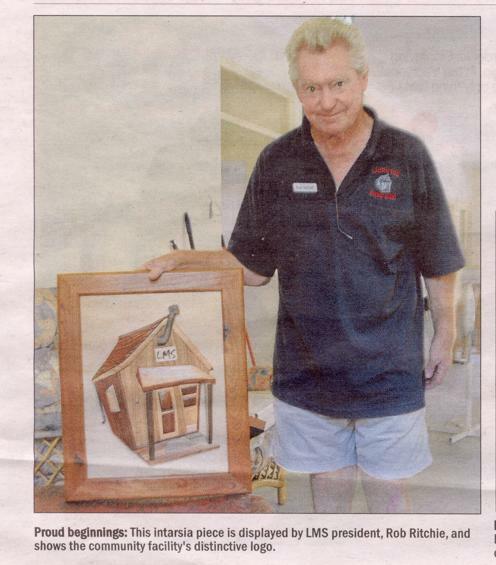 The Men’s Shed currently has 150 members are there are many diverse projects to appeal to all individuals. The group has a woodworking shop for members. 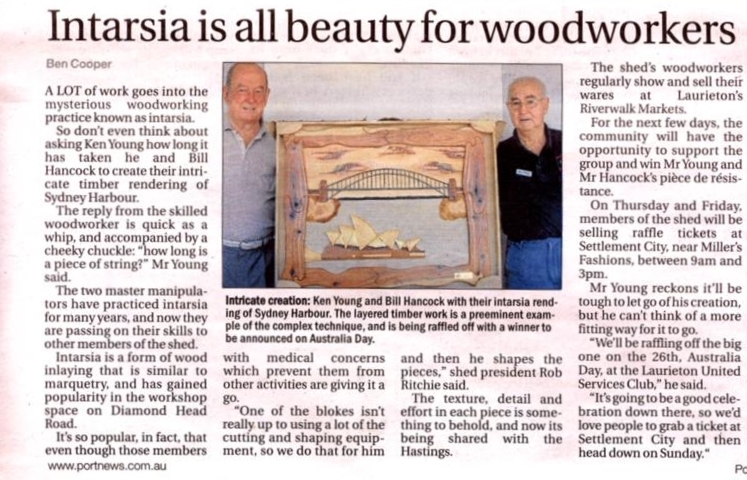 “It is always busy with members learning new skills, teaching old skills and with the production of a wide range of wooden items,” Mr Radford said. Members have restored a Morris Minor motor car and are currently working on the restoration of an old Bedford truck. They have also restored a trailer for the shed. Mr Radford said members also work on metal projects including repair and restoration of bicycles, lawn mowers and small engines. The group also has a vegetable garden and some bee hives. Through the Men’s Shed choir members work to entertain the elderly folk in the aged care facilities and community centers. “It gives us great pleasure and satisfaction, while putting big smiles on the residents’ faces,” Mr Radford said. Members do cooking every Thursday in the shed’s well equipped kitchen. “The Shed recently completed the construction of a fabulous wood fired pizza oven which, in the right hands, produces excellent pizzas and bread,” Mr Radford said. There are also computer classes for members on Thursdays. Mr Radford said the group helps the well-being of men including those who are retired and is forever striving to give the members what they require to keep them active and happy. For more information or to join call visit the Shed at Diamond Head Road, Dunbogan.